I know it's officially Autumn, but uncharacteristically the weather has been quite warm recently. I wonder how long this will last, the weather here in the UK is anything but boring it likes to keep us on your toes for sure. In an attempt to adjust my skincare in preparation for the cold weather (if you read my previous post, well you know how I feel about the colder months), I had to change it up a little to cater to the skin problems the colder weather conjures. My face isn't in the best condition at the moment and I know with the weather getting frostier and frostier my face is most probably going to facing some more hardship. My skin gets exceedingly dehydrated, and let me tell it's not pretty. Knowing this piece of knowledge gives me the upper hand because I can step up the hydration. For the longest time I have wanted to try the Caudalie Vinosource S.O.S thirst Quenching Serum, ever since hearing Chelsea from ChelseaWears rave about it and I thought we had similar skin types (as similar as it gets when it comes to skin). This serum contains organic grape water and hyaluronic acid to hydrate the skin, it works by restoring moisture balance in the skin. So far I have been loving the serum. The lightweight consistency feels refreshing, soothing and it absorbs into your skin almost instantly. Leaving your skin feeling hydrated and bouncy to the touch. It is great for wearing underneath your makeup because it creates a smooth base to work on. Thew scent is slightly too strong for me but bearable because the product is lovely. Something I have been loving is the Caudalie Grape Water, originally I was meant to get the famous Beauty Elixir when I remembered Caroline Hirons mention that the grape water was more hydrating (anything caroline Hirons says, goes apparently with me). Don't be fooled by the bland packaging as this product is definitely a dark horse. This summer was all about facial sprays for me and this made it through to my winter skincare routine. This simple yet effective grape water works to refresh and moisturise the skin. It adds an extra dose of hydration to the skin, I use it after my exfoliating toner both in the morning and evenings. The fine mist leaves my skin looking plump and refreshed. Another of my winter skincare woes is dull complexion, this is constant battle for me but undoubtedly worser in the colder seasons. For me, my winning combination does the trick perfectly! 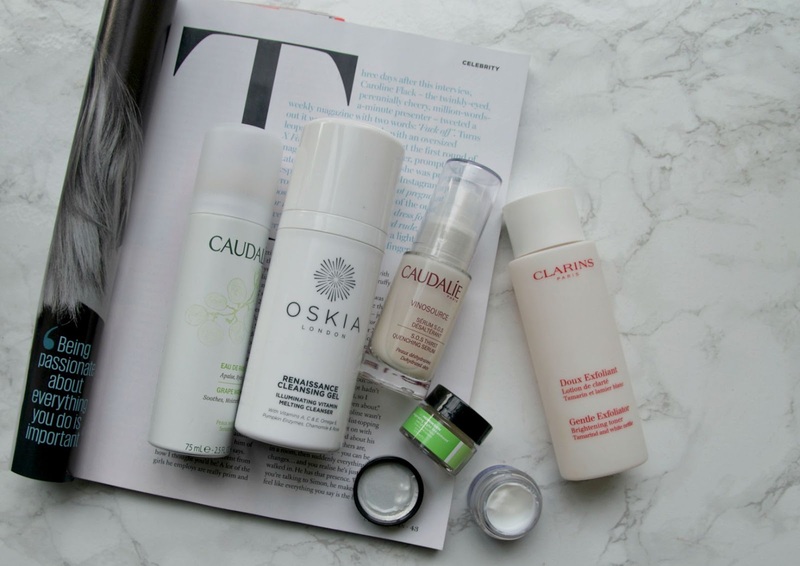 the Oskia Renaissance Cleansing Gel paired with the Clarins Gentle Exfoliating Toner almost gives my skin a new lease of life and looking instantly brighter (seriously impressed). Since I have been using these two, I have been getting compliments left, right and centre and it feel good as I am a haven't been that girl with good skin for a long time (we can blame acne for that). With acne comes dark scars which is a lot more visible with my darker skin tone, however within two weeks of using these two together they have nearly all disappeared. If you read my blog you probably already know how much I love the Oskia renaissance cleansing gel and the Clarins toner, so I won't go about them any longer but if you haven't seen check out what my full review of both here and here. More recent addition to my skincare routine are the Ole Henriksen Invigorating night treatment* and sheer transformation moisturiser*. This brand is pretty new to me, I haven't tried anything from them before although I was intrigued as I have heard a lot of good things about them. The moisturiser is really lightweight definitely more of a day time moisturiser. The thin consistency means that it absorbs into the skin really quickly and doesn't leave any greasy residue. I would most probably repurchase it and it is a really nice moisturiser. The overnight treatment is really interesting, it's unlike anything I have tried before. It is a exfoliating treatment that you leave on, which felt strange but I can see how it works. It tingles little as you first put it on your face but that goes away quickly.That is probably down to the AHA in the serum, which work to get rid of dead skin cells and the refine the skin surface to reveal a smoother and brighter complexion. I definitely notice that my skin is more brighter and my makeup goes on much better on the nights that I use this treatment. Let me know how you change up your skincare routine for the winter, in the words of Games of Throne winter is coming (that is bad sorry but I had to do it).